This week was my birthday so I decided to switch it up a bit and pick a juice from “The Detox Health-Plan Cookbook” by Maggie Pannell. It was a gift from my brother Tate and his Fiance Samantha. I picked one that gives a nod to summer as we grasp for the last warm days before the crisp Fall settles in to stay. Plus, many of the ladies joining us in juicing this month are actually using blenders, so I thought this one would turn out the best for them. Happy juicing ladies! Chop the watermelon and discard the rind and the seeds. Place the watermelon in a bowl and pour the chilled water over it and leave to stand for 10 minutes. 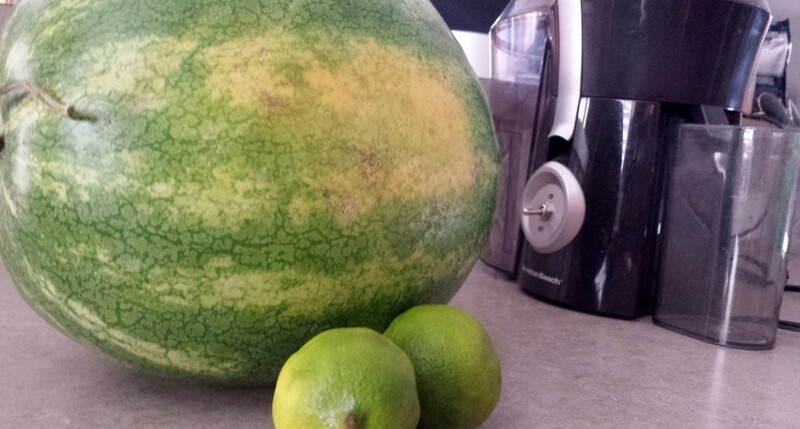 Strain the watermelon and then push them through a juicer. Stir in the lime juice and sweeten to taste with honey. You can also make this into a slush by freezing it and stir often. Then when crystals begin to form, serve immediately. This juice helps cool the body. It also helps calm and cleanse the digestive system. I might try a glass with a little juiced ginger just because I have liked the spice from the last two juices we did this month (Super Detox Elixir and Spicy Apple-Cucumber). Yum. I’ll get thd ingredients tomorrow. This juice was so sweet, I didn’t even add the honey! It really was absolutely refreshing and definitely tasted better with ice than without. I also tried it with a little added ginger and loved that combo as well. Of all the juices I have tried with ginger in them (or added in this case), this one is the sweetest so that the sweet to spicy ratio is quite balanced and possibly still leans to the sweet side.